Students encounter many standardized testing environments throughout their school life, and the American Test Anxieties Association reports 38 percent of students suffer from medium-high to high levels of test anxiety. When your child also struggles with a learning disorder, you know the testing process can become even more stressful. Here are a few tips to handle standardized testing and learning disorders so your child can reduce anxiety levels. Deep breathing, meditation and other relaxation techniques help your child work through anxious feelings before or during the test. Your child can work through negative thoughts and feelings during the meditation and achieve a more-relaxed state of mind. Sometimes your child may be anxious because he or she isn't sure what to expect during the test-taking process. One way you can help your child work through this concern is to practice test-taking strategies. For example, you can help your child learn to first answer questions about which there is uncertainty and to come back to other questions later in the test. Encourage your child to read through the entire test from start to finish before beginning, since answers to earlier questions may appear later on in the test. Help your child embrace positive feelings during the test-taking process so he or she can work through any negative thoughts. Repeating phrases such as "I have prepared well for this test" or "I'm a good student who knows this material" can help your child focus on positive thoughts. 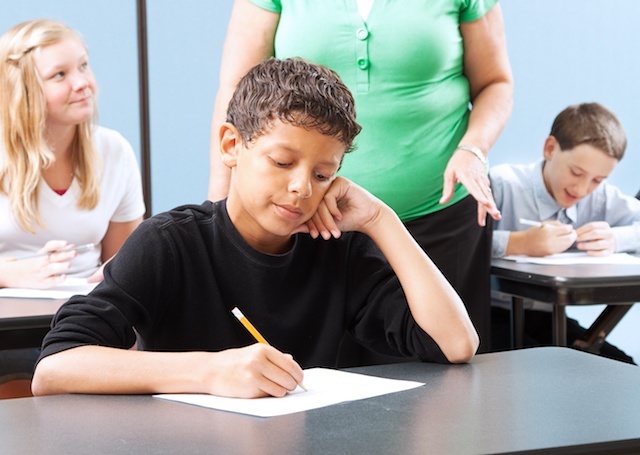 Some children with learning disorders have problems with the distractions present in a typical testing environment, such as noises from other students or outside the window. Consider giving your child a pair of ear plugs to help block out unwanted noises and focus full attention on the test. Your child's overall health has a big impact on his or her feelings about a test. Hunger, sickness or lack of sleep will make it more difficult to work through the test and stay focused, and your child may become more anxious than usual due to these mitigating circumstances. Set an early bedtime before standardized testing days, and encourage your child to get up early, leaving enough time to eat a relaxed and full breakfast before heading to school. Test anxiety and learning differences can be difficult to manage in a standardized testing environment. These techniques empower your child to handle test anxiety alongside other learning disorders to achieve academic success. If your child struggles with learning or has been diagnosed with a Learning Disorder, contact us online or find a center near you to learn more about how the Brain Balance Program can help.